Nonverbal tells. Liars don’t rehearse their gestures, just their words. The cognitive load is already huge, so when they tell their story, they freeze their upper body, look down, lower their voice, and slow their breathing and blink rate. And they will exhibit a recognizable moment of relief when the interview is over. Interrogators will often end an interview prematurely just to look for that shift in posture and relaxation. Verbal tells. People who are overly determined in their denial resort to non-contracted rather than relaxed language. “Did not” rather than “didn’t” They will use distancing language as in “ that woman” rather than someone’s name. They will often pepper their story with inappropriate detail as if to prove to you they are telling the truth. They will look you in the eye too much, as if to appear honest, when in fact most people telling the truth only look you in the eye a comfortable 60 % of the time. Stories told in perfect chronological order. Try to get them to tell their story backwards. They can’t do it. Honest people remember stories in the order of emotional prominence. 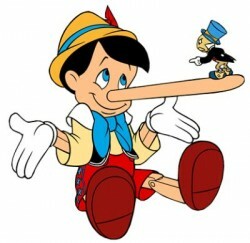 Liars tend to concoct a time-stamped story but they falter when asked to recount it differently.